When Felix Tshisekedi takes oath later today, he will become the Democratic Republic of Congo's (DRC) fifth president. His inauguration will mark the country's first peaceful democratic transition of power - and to an opposition leader at that. 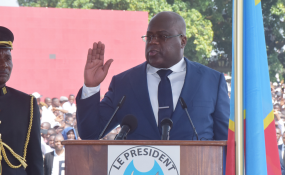 According to official results from the electoral commission (CENI), Tshisekedi won with 38.6% of the vote; opposition leader Martin Fayulu came in second with 34.8%; and the regime's candidate Emmanuel Ramazani Shadary was third with 23.8%. But these tallies vary hugely with both leaked numbers from CENI's computers and data collected by the Catholic Bishops' Conference's (CENCO) 40,000 observers. Their figures suggest that Fayulu was the real winner with an overwhelming 59.4%, and that Tshisekedi and Shadary got around 19% each. Fayulu challenged the results, but the constitutional court upheld them. In many ways, a Tshisekedi victory was the outcome no one was expecting. Outgoing president Joseph Kabila has spent the last few years clinging onto power. In the run-up to 2016, the year his mandate officially expired, he explored changing the constitution so he could run for a third term. When that didn't work, he simply delayed elections for two years until domestic and international pressure forced his hand. Some suspected Kabila would still find a way to run, but as the vote approached, the presidential majority known as the Front Commun pour le Congo (FCC) nominated Shadary as its candidate. The plan was presumably to use its extensive power and oversight over the electoral process to ensure his victory and the continuation of Kabila's rein by proxy. But Shadary proved so unpopular that even with heavy manipulation, it would have been impossible to declare him the winner without triggering mass protests. By contrast, Fayulu gained the backing of several opposition parties and soared in the polls. Faced with this conundrum, it is widely believed that Kabila improvised a deal. He couldn't install his own hand-picked candidate, so came up with an arrangement with Tshisekedi instead. The regime conceded the presidency to the second-placed opposition leader, but managed to keep Fayulu - and crucially his powerful supporters in former vice-president Jean-Pierre Bemba and former Katanga governor Moise Katumbi - out of power. In December 2018, the Congolese people did not only vote for a new president, but for members of the national parliament and provincial assemblies. And to everyone's surprise - or maybe not - the ruling FCC won overwhelmingly, significantly strengthening its majority by picking up 350 of the DRC's 500 parliamentary seats. Tshisekedi's Union pour la Démocratie et le Progrès Social (UDPS) won just 49, or less than 10% of the total. The FCC also won the largest number of seats in all 26 provincial councils. This means it can elect all the country's governors, giving it a monopoly on decision-making and access to financial resources at this level. President Tshisekedi will also find his powers stymied in other respects. The army top brass is made up of key Kabila allies, installed a few months ago. And the powerful patronage networks that gravitate around Kabila remain in place. Tshisekedi's team may try to break this up, but will find it tough-going. The FCC will be reluctant to offer the new president and his vice-president Vital Kamerhe much more than crumbs. It might offer to organise a state funeral for Tshisekedi's late father and veteran politician Etienne, whose remains have been in a morgue in Brussels since his death two years ago. It may offer up some key managerial posts in parastatals, giving up access to some public finances, and oversight of some minor ministries. But strategic positions such as security, foreign affairs and the economy will most likely remain under the close watch of the regime. The outgoing president may also have a final card up his sleeve to keep a leash on his successor. Rumours have been circulating for months that Tshisekedi included a faked diploma from an institute in Brussels in his registration to run for president. Last week, it emerged that the Congolese courts had asked the Belgian state to examine the document, which it confirmed was fake a month before the elections. This opens up the possibility that the DRC's constitutional court could choose to impeach Tshisekedi at any time. Beyond Tshisekedi's paradoxically tenuous presidential position, the elections have introduced many other new contradictions into the DRC's political system. The internal cohesion of Tshisekedi and Kamerhe's coalition known as CACH is not high neither. The new president and vice-president have a bad personal relationship. Their ad hoc alliance is built on convenience rather than a natural affinity, and the sharing of responsibilities of privileges among their supporters could prove tricky. Watching on from outside the Congo, African institutions also face a fascinating dilemma. Above all, they fear the negative impacts that instability in the DRC could cause for their own domestic situations. This is what motivated them since 2016 to put pressure on Kabila to step down and why they are now in a complicated bind. On the one hand, they know the election was not credible and that Congo's new improvised political set-up is unlikely to be sustainable in the medium- or long-term. And yet, it seems to be the only way to avoid chaos in the short-term. A rigged Shadary victory would have led to bloodshed. A Fayulu victory would never have been allowed by the regime. But an unexpected Kabila-brokered Tshisekedi win at least defuses any immediate explosive momentum. It is not surprising then that African multilateral institutions eventually endorsed the elections and have welcomed the Congo's new President-on-a-Leash Félix Tshisekedi.